Ingredients for Tomato sauce * You can use a sauce in a jar if you have one you really like, but this one is very easy and delicious. 28 oz can tomatoes, it doesn’t matter if they are whole, diced, or crushed, just make sure they don’t have added seasoning like basil and garlic – you are the boss of that! Melt butter with olive oil in a medium sized saucepan over medium high heat. Add onion, carrot, celery and garlic and cook until softened, about five minutes. Stir in undrained tomatoes, add bay leaf and wine. Let sauce simmer about 30 minutes. Let cool for 10 minutes off the stovetop. While the sauce is simmering, slice eggplant length-wise into ½ inch slices. Pour olive oil on to a baking sheet and tilt to spread evenly. Put the baking sheet in the oven for five minutes to heat surface. Dip eggplant in beaten egg and coat with panko. Flip eggplant slices and bake 10 more minutes on the other side. While eggplant bakes, pour slightly cooled tomato sauce in a blender and pulse a few times. The consistency is up to you; I like it a bit chunky. Return to sauce pan and add fresh basil if you are using it. 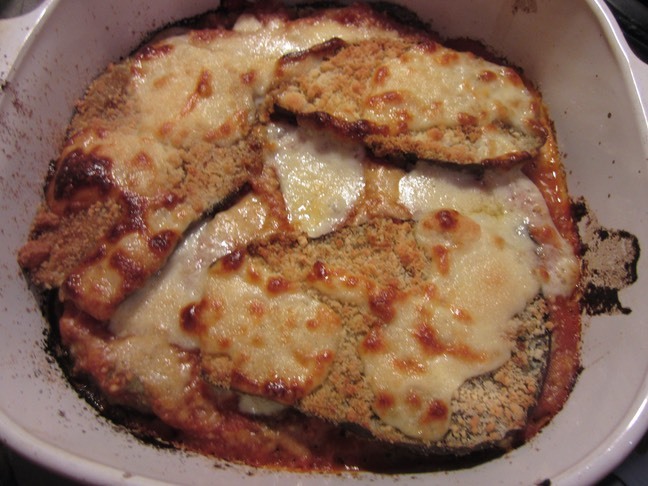 Use a baking dish large enough to make two layers of eggplant- mine was 8 x 8. Pour in a thin layer of tomato sauce, top with eggplant and top eggplant with half of the mozzarella and half of the Parmesan cheeses. Repeat with another layer of sauce, eggplant and cheese. Bake for 20 minutes until sauce is bubbly and cheese starts to brown.